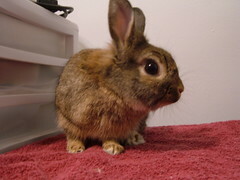 Yesterday I cut Cocoa's nails! It wasn't as hard as I thought it would be. Since I had never done it before, I just cut off a little. Cocoa was patient, although he seemed pretty nervous while I was doing it. 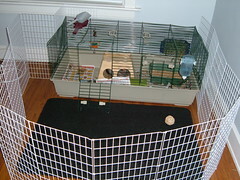 Also, I recently got a playpen to put around Cocoa's cage so he can come out and play more. The only bad thing is that he hasn't come out yet! He comes over by the door and looks out, but I think he is scared of the playpen. Also, I moved a few weeks ago so he isn't quite used to the new place. I hope he comes out soon! awww that's fantastic! :-) it won't be long before he comes out and doesn't go back in!!! what fun! Oooh, nice digs for your bunny!